To Teach or Not to Teach? | Yo, Yenta! Like it or not, summer’s is creeping to a close on its humid little squirrel feet. Of course, it’ll stay hot here in the South for months, but there’s been a shift in the air that always comes when it’s time to buy school supplies. There’s the requisite packs of black and white composition books and the specific type of nerdy mechanical pencils that Yenta Boy insists upon, but I’m also talking Hebrew bingo cards and punchout hamsas. I’ve taught Jewish education to kindergarteners on Sunday mornings for the past three years. For you non-Jews who are thinking “Why Sundays? I thought the Jewish Sabbath was on SATURDAY”, I share your confusion completely. Seems to me if synagogues wanted to get families back to services, then there should be Saturday programming before worship for everyone, including adults, since the thing about Judaism is that you could study it 24 hours a day, six days a week and still need Cliffs Notes. Some Jews send their kids to Jewish day school so there’s no need for them to supplement their Hebrew education, but most of us need some extracurricular schooling. But in the Reform and Conservative movements, expecting the least observant Jews to come to synagogue BOTH days of the weekend has never seemed like an effective plan. Unfortunately, I do not make the rules. In spite of the fact that I sometimes flick off the lights so we can pretend we’re in the belly of a whale, I’ve taken my role as a Jewish educator very seriously. 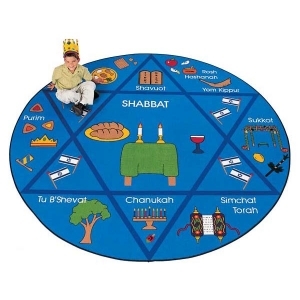 While no one would ever describe me as the kind of teacher who speaks gently and greets her students with fresh-baked cinnamon challah every week, I believe the kids who have passed through my class have had some good times and leave knowing a lot more than the first time they sit on my special round holiday rug. It feels good to give back to the community, to know I’m helping build a positive Jewish identity for dozen kids a year. But here’s the deal: My new day job is wicked demanding. My mother-in-law has taken another downward turn (oh, how many levels does this dementia spiral have, Lord?!) I want to work on a book. I need my weekends to regroup. I’m not someone who handles stress well; my coping skills when feeling overwhelmed tend towards crying, yelling and drinking wine (though yoga has diminished the need for those lately.) I’ve been thinking for a while that I need to take Shalom School off my plate for my own sanity, but I didn’t think the new principal could find a replacement and I don’t go back on agreements. Well, it turns out, there IS some other meshuggeneh who wants to spend their Sundays with Jewish kindergarteners. There’s an exit for this issue right there, with no hard feelings. All I have to do is turn over my rug and I’ve got Sunday mornings free. I’ll be just another Jewish mom dropping her kids off and then heading to the coffee shop to read the paper. But it turns out this isn’t so easy give up. I would miss the weekly connection—but that could easily be remedied by going to shul on Saturdays, where the rabbi does the lesson plan. I would miss seeing my own kids in the hall—but wow, drinking coffee and relaxing sounds much nicer than having to remind Little Miss So-and-So to quit picking her nose eight times an hour. I was SURE I wanted bow out and figure out another way to serve the Jewish community. I was already planning a couple of weekend trips away. But somehow yesterday, I found myself down the street trawling through the dry cleaners’ garbage, pulling the cardboard tubes off hangers for my favorite mezzuzot project. What do you think, friends? Should I jettison the guilt and take the gift of a clean getaway? Or do I shoulder the stress (minimal, since I’ve already got three years of lesson plans) and take on another year belting out “Rise and Shine” and “Shalom Rav” ’til I’m hoarse? Oh, and I need to make a decision by the staff meeting tonight at 7pm. This would be so much easier if it all took place on Saturdays. Maybe I should trade Shalom School for a place on the policies and programming board of the Union of Reform Judaism? I know they’d miss you but I can tell you that I cherish my Sunday “alone” time sitting at the Bean or in the park reading garbage and drinking coffee. Maybe you could offer to sub from time to time? I sometimes have those same feelings about giving up my Sunday mornings, esp. because 6th graders are not cute, earnest Kindergarteners with whom you can have fun with and educate at the same time(though the maturity level sometimes is the same). So for me, I keep thinking about my kids and how, even if in other ways, our Jewish involvement loses some strength, at least they’re seeing the importance of Jewish education from their own parent. I will miss you oh so much if you go! Aw, thank you, peeps. I’ve made the decision to bow out: how could I not when the new Miz M is so full of enthusiasm?! I hope to be around to teach the occasional yoga session and of course, sub.